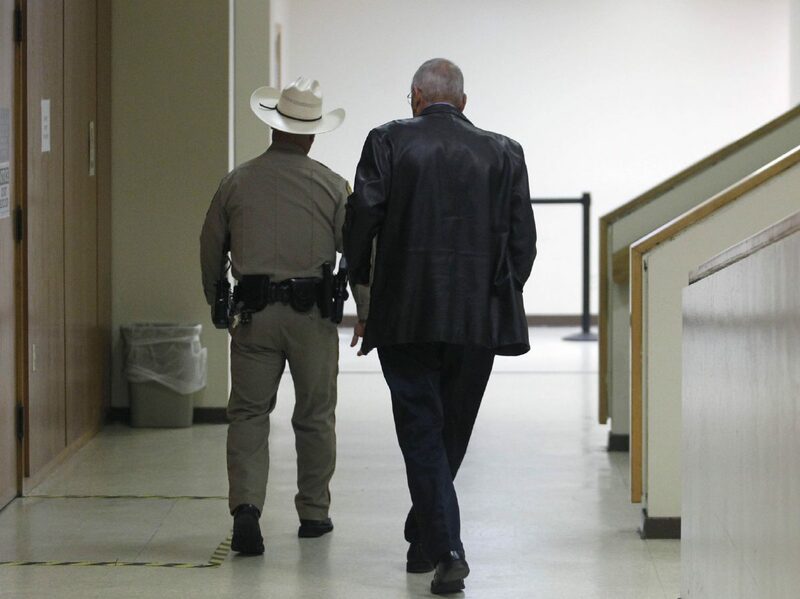 Corpus Bail Bonds owner Arnaldo Corpus walks away from the courtroom after his attorney filed a request for the judge to be recused from his bond forfeiture case Thursday, Dec. 28, 2017, at the Hidalgo County Courthouse in Edinburg. Corpus posted a $50,000 bond for former Hidalgo County District Clerk Omar Guerrero, who is believed to have fled to Mexico. EDINBURG — What’s another month or so if more than 1,600 days have already expired to collect a forfeited bond? That’s the situation Hidalgo County finds itself in after Omar Guerrero’s bond forfeiture trial was delayed at the last minute Thursday morning. The delay came when an attorney representing bondsman Arnaldo Corpus announced he had filed a motion to recuse the judge, effectively putting all further proceedings on hold. 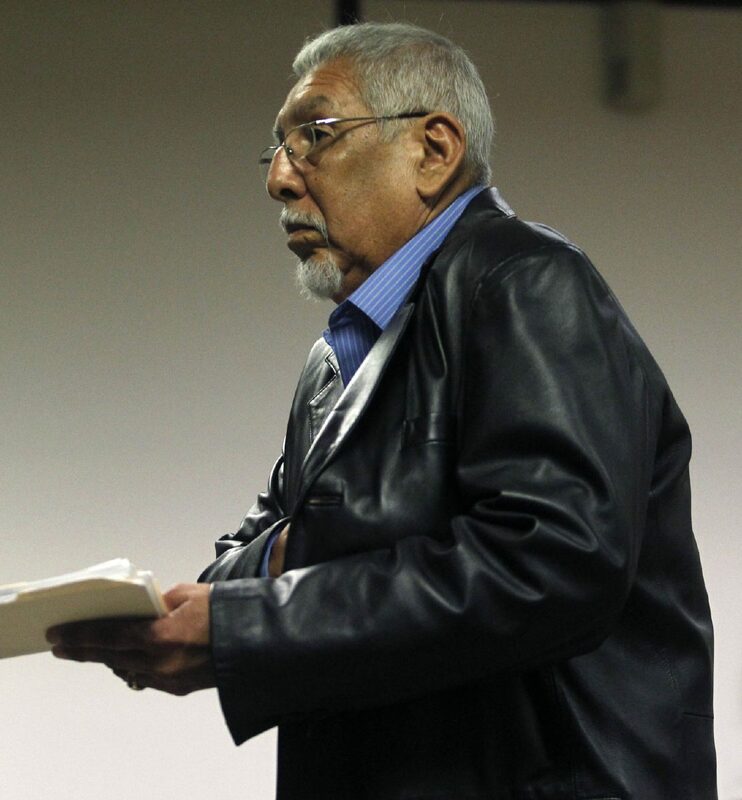 The motion — which was filed just before the trial was set to begin — was news to both County Court-at-Law Judge Rodolfo Gonzalez and the assistant district attorney trying the case. Until Thursday morning, Corpus had appeared without an attorney at previous hearings. Corpus Bail Bonds owner Arnaldo Corpus walks out of the courtroom after his attorney filed a request for the judge to be recused from his bond forfeiture case Thursday, Dec. 28, 2017, at the Hidalgo County Courthouse in Edinburg. Corpus posted a $50,000 bond for former Hidalgo County District Clerk Omar Guerrero, who is believed to have fled to Mexico. His attorney, Oscar Alvarez, said he’d only been hired last night, hours after Gonzalez told Corpus the case was finally going to trial after 1,678 days of delays. Corpus posted a $50,000 bond for Guerrero in May 2013, after the former district clerk was charged with tampering with identification numbers on an assault rifle. The bond was forfeited when Guerrero failed to appear in court later that same month to be arraigned on new charges for sexual assault. Guerrero remains at large and is believed to be hiding in Mexico. The purpose of a bond is to guarantee that a person arrested for a crime appears in court upon their release from jail. Most people must only pay 10 percent of their total bond, but if they fail to appear in court, the bond company is liable for the full amount. Corpus, who owns Corpus Bail Bonds, knew Guerrero had a history of fleeing the country rather than facing the charges against him. In December 2006, Guerrero went missing after police issued an arrest warrant for him on sexual assault charges for which he was later acquitted; he was arrested in February 2007 in Reynosa, Mexico. Despite this, Corpus — who is a cousin of Guerrero’s mother — covered his bond in 2013. Not only did he cover the bond for the tampering charge, he also contributed $300,000 toward the $1 million bond for cocaine possession, which was another charge Guerrero was arrested for at the time. That outstanding bond has yet to be collected and no forfeiture hearings have been set in that case since a judgment nisi — or intermediary judgment that has not been finalized — was set in June 2016, according to court records. Corpus declined to comment Thursday afternoon, citing the advice of his attorney, and quickly left the courthouse after Gonzalez ruled he would take no further action on the case until District Judge Missy Medary, the presiding judge for the 5th Administrative Judicial Region, rules whether or not he should recuse himself from the case. If Medary rules Gonzalez should be recused, she will appoint a new judge to hear the case. Medary has an indefinite amount of time — defined as “as soon as practicable” — to rule on Alvarez’s motion. Alvarez told The Monitor that “there are some issues that have been raised by my client that potentially would cause the court to comment on the weight of the evidence,” adding that a court employee may be called as a witness. “Those are things that we’re looking at now and another judge will determine whether there’s merit to the allegation and whether it’s sufficient to reconsider,” Alvarez continued. For now, Corpus is off the hook, conceivably giving him more time to track down Guerrero, which may be his last resort in eventually handing over the forfeited bond to the county.